Di Resta managed to pass poleman Paffett at the start of the race, hanging tough around the outside at Paddock Hill and Druids before slipping up the inside at Graham Hill Bend. Behind, a safety car period was triggered when Lucas Auer lost the rear of his Mercedes exiting Graham Hill and slid into the path of Robin Frijns, with Augusto Farfus also clipping Auer’s car and sustaining damage. But di Resta held the lead in the two-by-two formation restart, and the Scotsman held a slender advantage of less than a second before Paffett dived into the pits at the end of the eighth lap to serve his mandatory stop. Di Resta came in the following lap but rejoined ahead of Paffett, and it was Audi driver Jamie Green assuming the lead at this point of the race as the threat of rain hung in the air. Green stayed out until the end of the 30th lap before finally making his stop, handing the lead back to Di Resta – who duly hung on to score victory by one second from Paffett to lead a Mercedes 1-2. Rene Rast managed to move up to third at the expense of ex-Formula 1 driver Pascal Wehrlein to take a net third early on, and was able to close a two-second gap to the leaders in the latter stages. But the reigning champion couldn’t find a way past Paffett and settled for third, his second podium finish of the season. Green rejoined in fourth after making his stop, but he dropped behind Wehrlein on his outlap and then succumbed to BMW man Marco Wittmann, edging the two-time champion onto the grass on the run to Surtees in the process. That meant Green was given a drive-through penalty for forcing another driver onto the grass, dropping the Audi driver out of the points, although Wittmann was still forced to fend off Mike Rockenfeller’s Audi late on in the fight for fifth. 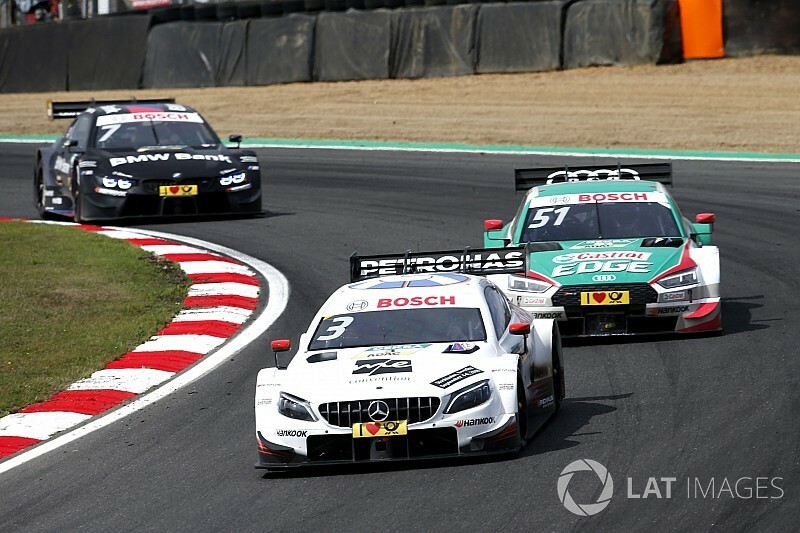 Philipp Eng (BMW) was seventh, ahead of a recovering Auer, Saturday race winner Daniel Juncadella (Mercedes) and Nico Muller (Audi) rounding out the points positions. Green ended up 15th after his penalty, only ahead of three drivers who hit trouble. Loic Duval sustained a puncture late in the race, costing him a chance of points, Edoardo Mortara left his pitbox before his right-rear wheel was attached and was a late retirement, and Farfus retired as a result of his early damage.